Wash, drain and cut up spinach and mix with bacon, eggs and Pepperidge Farm dressing. Prepare the dressing in a blender by combining the sugar, vinegar, oil, onion, mustard, celery seed, salt and pepper. Put in an airtight jar and chill in refrigerator. Mix salad dressing with spinach salad ingredients just before serving. 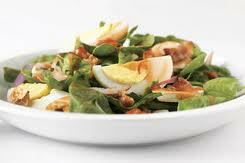 The spinach salad recipe is ready to serve...enjoy !